After several “low volume” projects recently I wanted to do something different, loud, bright. I found inspiration in the pages of my husband’s Adventure Time comic for my new block. If you know Adventure Time at all you will see the strong influence of Princess Bubblegum in this block. She regularly pops up in Jake & Finn’s crazy adventures. Now if you do not know Adventure Time, this is Princess Bubblegum. With this block I did not let the pattern’s unpleasant name ( “turkey giblets”) turn me off. 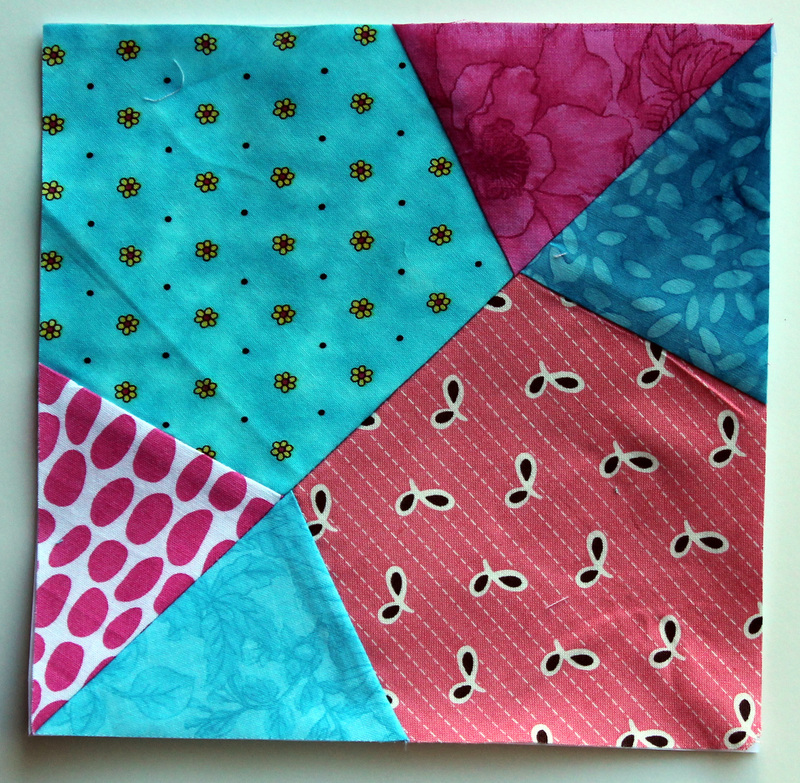 You can find the paper piecing pattern I used at Quilters Cache. It is a really easy pattern to make and is made up of two triangle blocks that are joined to make the building block of the quilt. I can not wait to see how this quilt top comes together. I think it is going to be a quilt like my “Sun & Sea” quilt where the final overall quilt pattern looks so different from the individual block pattern. Um, “turkey giblets”?! I love the weird names that some traditional blocks have. (Here’s an overly-cerebral idea for a quilt: only choose blocks with the weirdest traditional names! I oughta do that some day.) A whole quilt out of these blocks is going to be stunning. I can’t wait to see it grow. Oh, this is going to be even better than Sun and Sea. There are all those secondary “octagons” in the corners! 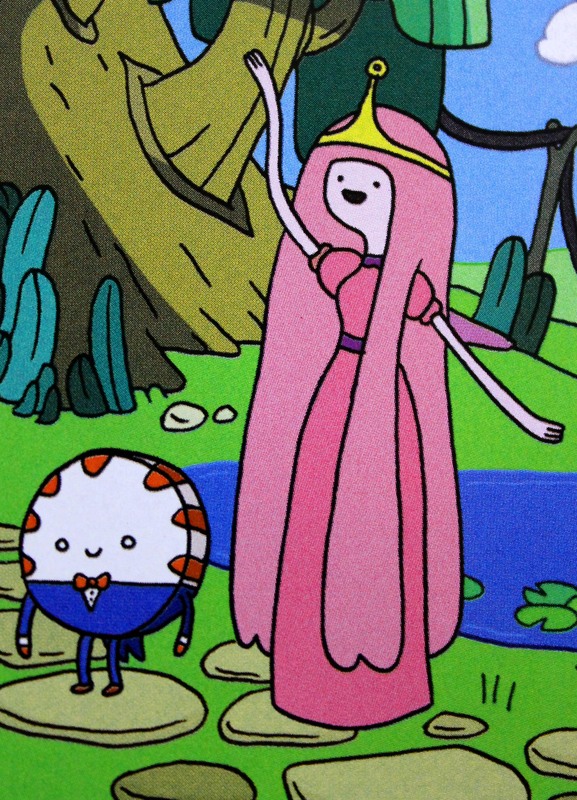 My son watches Adventure Time and I like to watch it with him, so we are familiar with Princess Bubblegum and Peppermint Butler. Great inspiration! Glad to see you working your magic on bright colours again! Thanks Lorna… my husband keeps trying to get me to add some Jake colours into the quilt. To quieten him I have promised a Jake inspired quilt. More bright colours on the horizon! another lovely color combination. This is not that gross artificial bubble gum flavor. It’s the real thing. Love the colors together, and what a pretty block! I think the quiet of the low volume makes the loud of the brights so much more intense. 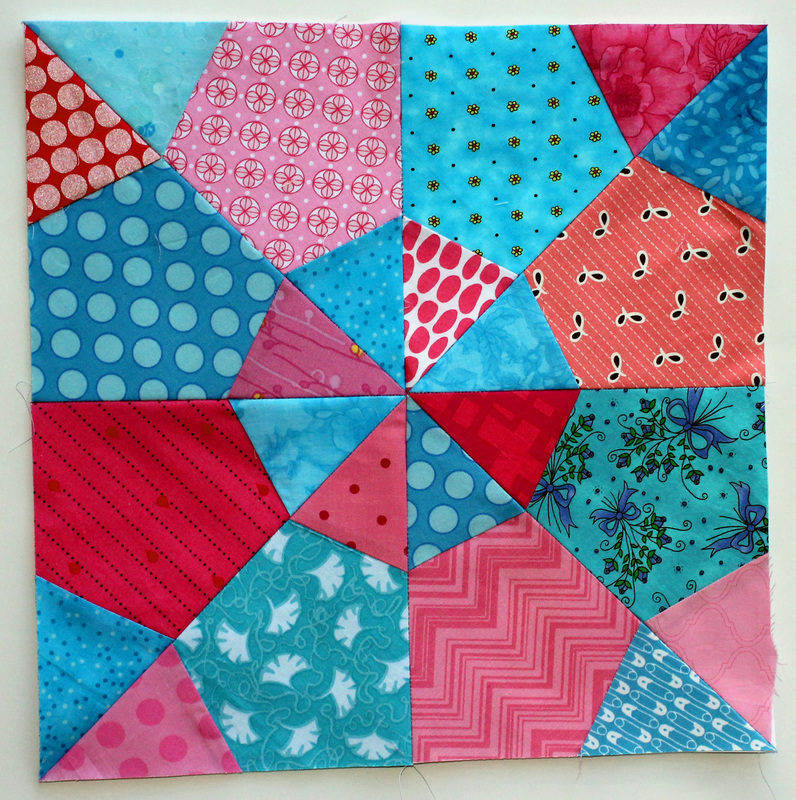 I must admit I am loving making these blocks… the top is looking obnoxiously bright! Great colour choices! Looks like there’d be a fab repeat pattern with those blocks! You have to love a woman who finds inspiration from her husband’s dumb cartoon show! Must be true love! I have three boys and know Adventure Time well…I am still chuckling as I type this….maybe I need to see the cartoons on adult swim with different eyes….THANKS for your post!!! It is a silly show but so insanely colourful. There is at least one other quilt I want to make inspired by their palette. I think Jake yellow and Finn blue would rock in a quilt too. Thanks. I really do love taking old patterns and giving them a scrappy new twist. This block was just ripe for some loud bright colours. I really like this block, and you did a great job piecing it. Nicely done. Can’t wait to see more. Thanks. I am loving how the blocks are coming together.